This recipe totally surprised me! No it's not as dense as regular pecan pie because it doesn't have butter, eggs and corn syrup, but I promise the taste is phenomenal! I found the original recipe on SB Canning, who is a certified Master Preserver. As it states on her page "she wants to help people who are Canning and Preserving food to become more sustainable. It is a very important way for those who garden, have dietary requirements, or just want to save money on food. SB Canning is dedicated to teaching how this can be accomplished but in the safest, straightforward, and most practical way." 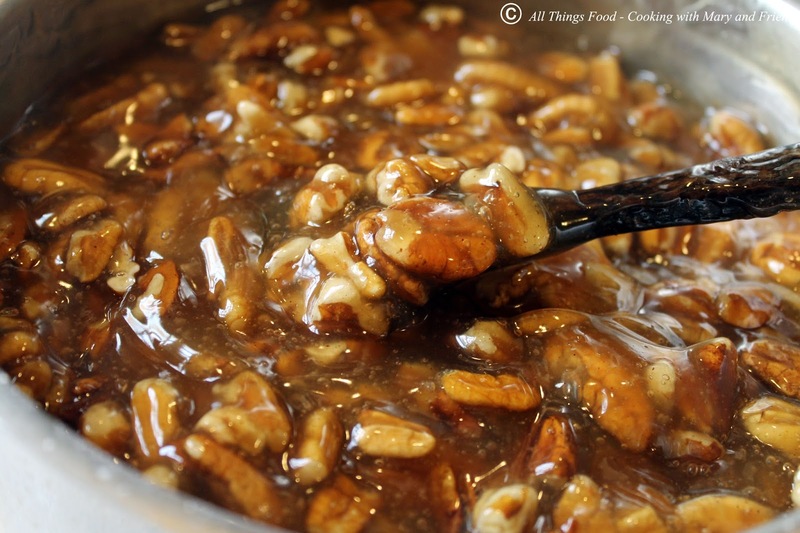 This pecan pie filling would be awesome as a pie, baked in mini-tartlets, or warmed and spooned over vanilla ice-cream or plain pound cake. Combine apple juice, sugar, Clear Jel®, and spices and extract in a large sauce pan. Stir and cook over medium high heat until mixture thickens and begins to bubble, stirring and whisking often to keep smooth. Add lemon juice and boil sauce 1 minute more, stirring constantly. Fold in pecans. Fill hot jars leaving 1-inch head-space. Remove air bubbles and adjust head-space if needed. Wipe rims of jars with a dampened clean paper towel. Adjust lids and process immediately. Process in a boiling water bath for 20 minutes. Remove jars and allow to cool on a kitchen towel on your counter-top 24 hours. Store jars in pantry up to one year. Open jars need to be refrigerated. 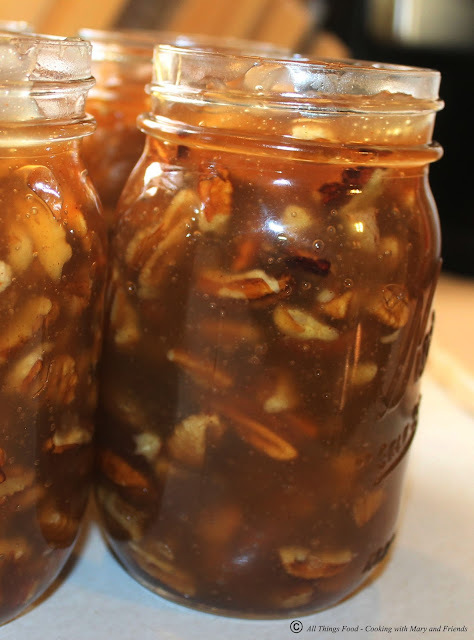 Pour contents of 1 quart or 2 pint jars into an unbaked 9-in pie shell. Top with pecan halves and bake in preheated oven for 10 minutes at 400 degrees, then reduce temperature to 350 degrees and bake for 30 minutes or until crust is golden brown. Remember the filling is already cooked so you are just cooking the pie shell and reheating until the filling is bubbly. Let the pie cool completely before cutting. ** Clear Jel (spelled with one “L”) is a modified food starch that is used as a thickening agent in canning recipes. 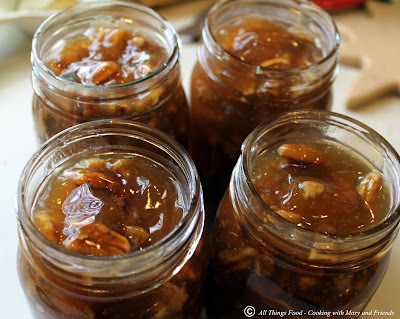 It is most commonly used in canned apple pie filling, but can also be used in other pie fillings, other preserves, canned soups, etc. It's actually a modified corn starch (NOT regular corn starch) that is resistant to breaking down under high temperatures and various pH levels. It has no flavor and comes as a white powder. The advantage of Clear Jel is that it is able to thicken the food evenly (without lumps) even when it is subjected to the sustained temperatures of the canning process. (Water bathed or pressure canned) When used in canned pie filling, it will bake into a beautiful pie with just the right amount of thickening and you'll never even know it's there.